Why do we need Aadhaar? Although there is still no clarity, several central and state-level ministries are issuing notifications making Aadhaar mandatory. Aadhaar is arguably one of the most convoluted public policy interventions in India’s history. It has been more than eight years, yet there is little clarity on the exact purpose of the biometric-based unique identification project. Let me take you through an event which I witnessed seven years ago in Delhi. One morning in early 2010 I walked into a convention centre near Connaught Place to attend a session on e-governance. It was a closed room conference, a capacity building session, for the officials working with the ministry of electronics and information technology (then ministry of communications and IT). I knew some of the ministry officials and hence secured an entry. That day the first presentation was made on Aadhaar. By the time I entered the hall, a senior official from the UIDAI had already started with the presentation. After a few slides about the project design and architecture, the official turned to clarifying why Aadhaar was not only for Indian citizens, but for all residents, including illegal Bangladeshi immigrants. The official told the gathering: it will be easier for agencies to track an immigrant with Aadhaar, vis-à-vis, an immigrant without Aadhaar. This was the time when UIDAI officials including chairman Nandan Nilekani publicly maintained that the only purpose to give Aadhaar to Indian residents was to provide an identity to the poor, who often struggled to get a service in absence of a proof of residence and proof of identity. The second purpose was to root out bogus or ghost beneficiaries from several government databases and hence rationalize the distribution and delivery of government subsidy. In every single interview, both top most UIDAI officials and leaders in the UPA government denied the possibility of usage of Aadhaar for surveillance and tracking, and reaffirmed that targeting government subsidy was the true purpose. It is another thing that there have been ample studies and reports showing Aadhaar’s limited success on both the fronts. Even today Aadhaar is one of the KYC documents one has to produce to get a service. Corruption in service delivery goes beyond faulty and erroneous databases. Aadhaar-based PDS ration, scholarship and pension disbursal in Rajasthan, Delhi and Jharkhand belie governments’ over optimism. For all practical reasons it has not been a smooth journey for Aadhaar -- from being virtually torn apart by a standing committee of parliament headed by senior BJP leader Yashwant Sinha to several interim rulings of the Supreme Court reprimanding the government for making Aadhaar mandatory. In the months approaching 2014 general elections, several senior BJP leaders including Narendra Modi, who is now prime minister, and Arun Jaitley, who is now the finance minister, opined against Aadhaar. Yet the project re-emerged, this time with greater vigour, with the passing of Aadhaar legislation. According to the law, a person has to produce Aadhaar number to avail a government subsidy or benefit, which comes from the Consolidated Fund of India. The law, in theory, talked about an alternate mechanism for those not having Aadhaar, to avail a service. 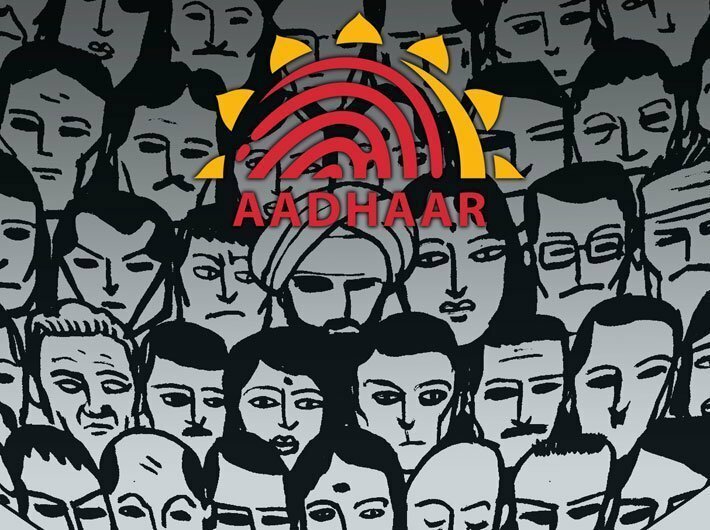 It also allowed UIDAI to sell demographic data of enrolled individuals to even private agencies – a provision which wasn’t there in the initial drafts of the Aadhaar legislation. Although there is still no clarity, several central and state-level ministries are issuing notifications making Aadhaar mandatory. As of now, one had to produce an Aadhaar for PDS, LPG, scholarship, job card under MNREGA, pension, etc. In few months from now, it will be mandatory to produce Aadhaar for mid-day meal, PAN card, filing income tax returns or getting a mobile SIM card. While this was still being debated whether government can make Aadhaar mandatory for PAN and IT returns, Justice JS Khehar, chief justice of India, in a case hearing related to Aadhaar, said that while the government can’t make Aadhaar mandatory for entitlements it can link Aadhaar with PAN and income tax. It is contrary to its October 16, 2015, judgement, where in the apex court allowed Aadhaar linkage with pension, provident fund and disbursing wages under MNREGA, only on one condition -- Aadhaar will not be a condition for providing or denying a service. Yet in Justice Khehar’s opinion the government can go ahead and make Aadhaar mandatory for PAN card and IT returns. The move doesn’t take under consideration the fact that India doesn’t have a law on privacy. There is practically nothing which would make it illegal for any government or private organisation to use Aadhaar data of over a billion Indian residents without their consent. As Aadhaar becomes a mandatory requirement for more and more services, it will not only encourage hackers, but would also make profiling and tracking a child’s play for private corporations and individuals. All in the name of providing an identity and eliminating corruption!